America's Cup knows that cats are the future. Interior visibility – The salon on a catamaran is a dry, comfortable, and brightly lit navigation center. Too hot or cold? Stay inside and navigate via the panoramic view of the sea. Take a quick look at monohulls, and you will see that they do their best to have inside visibility with deck salons and pilot houses but cannot compete with the space inside the naturally open salon of a multihull. Draft – For the Keys, Cheasapeake Bay, and Bahamas, shoal draft can never be shoal enough. 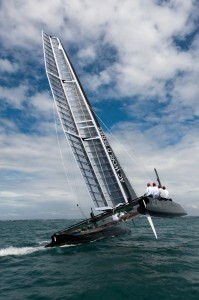 Catamarans draw little with daggerboads or fixed keels. Expect less than 4 to 5′ draft vs. realistically 6’+ on equivalently accommadated monos despite what the manufacturer may claim. Stability – Heeling is the norm on a monohull where every item aboard must be secured and routine tasks like using the head can become difficult endeavors. A catamaran stays flat even in the worst seaway. This makes sleeping, eating, cooking, and all the other tasks of life aboard simpler. Privacy – Two or three separate hulls each provide private sleeping quarters. Stick the kids in one and close the door. Owner version cats are especially private with a large berth and master head instead of two staterooms in a hull (catamaran layouts are nearly all the same). Performance – Multis are faster than monos, downwind at least. And most of the time crising you motor upwind anyways. Less surface area under water means less resistance and more speed. Helm visibility – The view from the helm depends on the model, but in general you sit high up and can see all four corners. This high positioning eases maneuvering and docking. Maneuverability – Because of the twin diesels on any reasonable cat, a captain can turn sharper than with a single engine. The distance between the engines allows for less prop wash than on twin diesel monos. Cockpit Space – While less important than on a mono, the large seating area on cats is a great platform for dining out, lounging around dockside, and grilling fresh fish. Redundancy – Having one engine to spare is a good feeling. You know you can limp back into port. The chance of both engines failing is low. Swim access – The two swim platform that terminate most cats allow for incredible access to the water for fishing and diving. Of course multis are not without negatives which include upwind performance, durability, and offshore pounding. But for the average cruising couple these underweigh the 10 reasons above. The real limiter these days is cost and not just the initial purchase price but dockage and haul costs. Are two hulls better than one? You can argue compellingly yes. Another question is whether this applies to power yachts as well. Are power cats the future? What about trimarans? Are three hulls better than two? How about you. Do you think two hulls are better than one? Gaze out over your harbor. How many multihulls share your home port? Imagine being surrounded by multis. Are catamarans the future of sailing? Please feel free to comment anonymously or by name in the field below. I hope to hear from you.